Technological enhancements turn enterprises to work smarter and more efficiently – but choosing the right technology matters. Providing innovative, flexible and efficient solutions helps enterprises to provide a better experience to their customers. By adapting cloud architecture, enterprises can achieve these objectives effectively. FourD provides cloud based IT infrastructure and managed services to small and medium enterprises. With FourD on your side, your IT will always be up and running efficiently. Cloud Services offer high scalability and reliability with reduced costs. Enterprises can enhance their business by moving their infrastructure to the cloud. 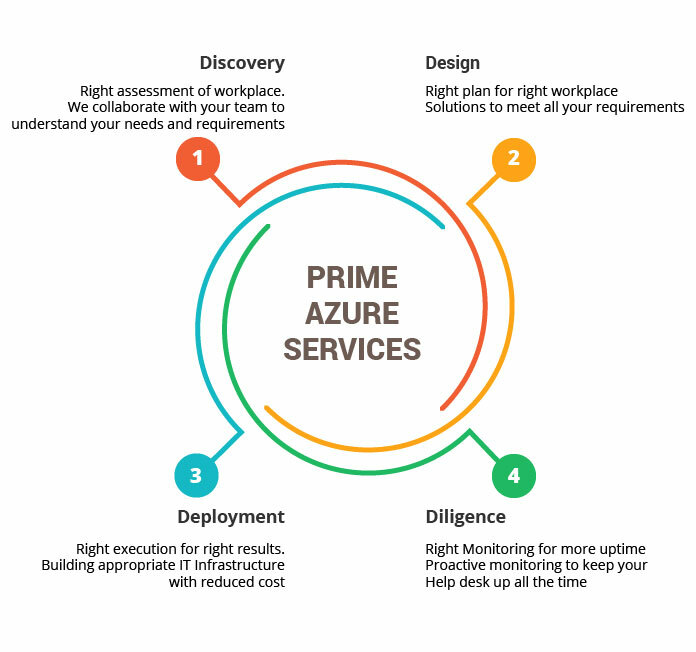 With FourD’s Prime Azure Services, enterprises can modernize their IT environment and make it more dynamic. As a Certified Gold Partner of Microsoft, FourD seamlessly integrates your working environment with Azure IT environment. FourD employs a ‘4D for Cloud’ methodology to provide extensive IT infrastructure services. The 4D for Cloud helps you to leverage the overall benefits of the cloud. The 4D for Cloud stands for – Discovery, Design, Deployment and Diligence. Optimizing work practices improve the productivity of businesses. FourD provides efficient solutions that assist enterprises in the cloud transformation process. With FourD’s Active Office 365, you can achieve the best of Office 365. Being a Gold partner of Microsoft, we provide overall business productivity solutions. High performance in the work place is assured by the integration of Office 365 applications. Connect, chat and conference with your team easily. Store, access and manage business data efficiently. Create and manage files on the go. Identify, authenticate and control users easily to secure data. One of the critical processes is migrating physical infrastructure, business data and applications to the cloud. FourD supports you in the process of migration. We pick selective and required features of Office 365 to initiate strategies that drive and achieve more business value. Lotus/IBM Notes to Cloud Office 365. And together, FourD provides managed services. With FourD’s managed services, enterprises can streamline their business operations efficiently.